When the world shifted on its axis and something momentous happened, I was there and I was a part of making it happen. Because I was there on what could be the very last National Polio Immunisation Day in India. And that’s thanks, in no small way, to the truly phenomenal efforts of Rotary International - because the mass, global immunisation programme, which was started by Rotary in the Philippines in 1979, has seen polio virtually eradicated worldwide. So, in a single generation, this scourge, that left victims dead or disabled, has been conquered – and Rotarians across the globe can take much of the credit for this world-altering fact. British Rotarians alone have contributed no less than £20m to combat this disease, supported by many partners including the Bill and Melinda Gates Foundation. It would be fair to say I am not a natural nurse - I’m a hard-bitten hack and when the sympathy gene was being handed out, I was probably in the pub, but being given this opportunity to be involved in an event that will make history – and change the world for the better - was immense. I’m a novice member of Hereford City Rotary Club, and we were invited by the Rotary Club of Mahanagar, in Kolkata to assist in their work on the NID in January. It’s overwhelming, exhausting, frenetic, noisy, smelly and the traffic has frankly got to be seen to be believed. Two-lane roads carry vehicles five abreast with bikes, motorcycles, tuk-tuks and rickshaws weaving between; horns blare constantly – and in the middle of it all a cow – sacred to the Hindus – will just mooch about. I have never felt more foreign in my life. Yet conversely I have never felt more welcome. India is the country of courtesy. It is also home to some of the most deprived areas in the world – and it was in the thick of these Kolkata slums that I, and four of my Hereford City Rotary Club colleagues, and two Mahanagar Rotarians, Ashok Kumar Agarawal and Deepak Chowdnury, equipped with a coolbox full of vaccines, found ourselves on January 28. My birthday – and one I will never ever forget. Making up our diverse crew was a tuktuk complete with loudspeaker sending out a siren call to parents to bring out their children to benefit from the immunisation programme. And as soon as we arrived we were mobbed… many of these parents were among the first to be immunised themselves when the polio eradication programme first began, and despite the poverty of their circumstances their love and concern for the health and wellbeing of their beautiful children shone out. While use of the English language is widespread in India, in these areas of deprivation, where the education of girls is particularly low, our lack of Bengali should have been an issue. But it wasn’t. The international language of care was more than adequate. Dressed in our very fetching bright yellow polo shirts and baseball caps we couldn’t have been more visible and soon set up a chain system, with some of our number on crowd control – and forming a barricade between us and the manic traffic, others marshalling the children; one dispensing the life-saving two drops of vaccine to waiting open mouths; another Sharpie-marking little fingers to show they’d been ‘done’ and yet another dishing out a gift for the immunised. And if there is ever a salutary lesson on the nature of Western consumerism and greed it was the look of sheer joy on the faces of those tiny children when they were handed a small, plastic ball as a reward for taking their medicine so bravely. Now that really was humbling. I was actively involved in immunising around 100 under-fives; the rest of the team completed more than 500 by the end of the day and across the world more than 2.5 billion children have received the polio vaccine - most dispensed by amateurs like me. 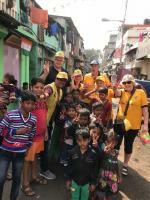 Anyone who thinks Rotary is just a lunch club for businessmen they should look at its truly amazing humanitarian work – being given the chance to be part of something like the NID has changed me fundamentally – I am so proud of my involvement and of the links we have made with Rotarians on the other side of the globe. 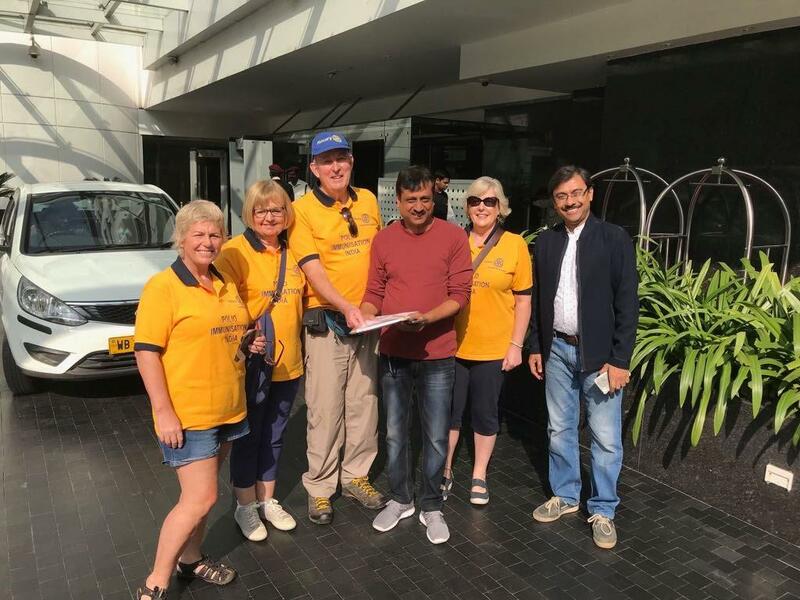 Hereford City Rotary Club and the Kolkata Mahanagar club have generated ties that will continue – I have promised to send regular contributions to a joint Mahanagar/Hereford newsletter that I and Rotarian Payal Agarwal are planning to put together and we hope to work together on other projects too. Before our return to the UK we also visited the Cochin Rotary Club where we were inspired by Foundation Trustee Elect Gulam Vahanvaty, who was the guest speaker. His views on recruitment, and more importantly retention and engagement, of Rotarians has proved a talking point for us ever since we got back. 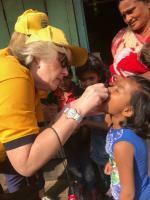 I will never do anything as amazing as my contribution to eradicating polio – tiny though it was in the great scheme of the programme and I am endlessly grateful to Rotary; to my new friends in the Mahanagar club for arranging the opportunity – and to my fellow Hereford City Rotarians for helping me to enjoy the experience of a lifetime.